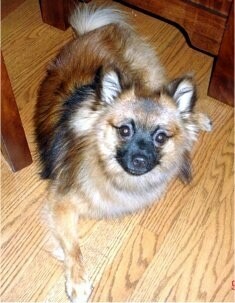 Lil Bear the Small German Spitz at one year old—"Handsome boy!! He always has time to pose for the camera!! He honestly acts like he's one of the humans. LOL." 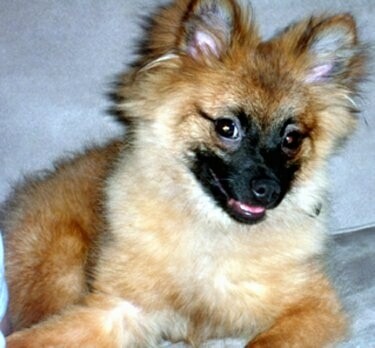 The Toy German Spitz comes in a wide variety of coat colors, including black, brown, orange, wolf gray and white. The compact, triangular ears are close together and high set. The hair on the head is short compared the rest of the body, but it is still very thick. The feet are very small with hair in between the toes. The eyes appear to be proportionally large. The tail is curled on top of the back and lies against the side of the body. Happy, alert, watchful and buoyant, German Spitzes make good watchdogs. They are excellent jumpers and love to stand on their hind legs. They enjoy a lot of human attention, and are very happy to please. Teach this dog early that it may bark a couple of times when the doorbell rings or when there are visitors, but then to keep quiet. Be very consistent about this. They are alert, curious and very busy. They must be taught that the owner is the boss, or they will not listen. This breed may become too demanding if the owner allows it. If you do not show this dog all humans are pack leader to him, he will not be trustworthy with children. They may become nervous and snappish towards them. However, they can get along well with children so long as the child is taught how to demonstrate leadership skills. It is a good companion for an elderly person. Without a stern, confident, consistent pack leader, they will be feisty, willful, bold, temperamental, and will not be easy to obedience train. When trained properly they make good companions. Along with being a strong pack leader, socialize well to avoid them from becoming reserved and barking at strangers, other dogs and animals, which may lead to dog aggressiveness. They are very beautiful and elegant in the show ring. The best way to reinforce your pack leader status is to take them for daily pack walks. This not only helps the dog see you as the leader, but it releases mental and physical energy, making the dog stable minded, levelheaded and confident that he knows his place in the world. The German Spitz is good for apartment life. It is fairly active indoors and a small yard will suit it. This breed needs to be taken on a daily walk or jog. It will happily accompany its owners on a 20-mile walk or one-mile daily walk. Regular brushing is needed to prevent matting. Some Spitzes do not like to be groomed and you have to teach them to stay for you during the grooming session. The German Spitz is directly descended from the profusely coated Nordic herding dogs, such as the Samoyed and the Lapphund. It was said to have arrived in Europe with Viking plunderers. German literature refers to the Spitz as early as 1450. 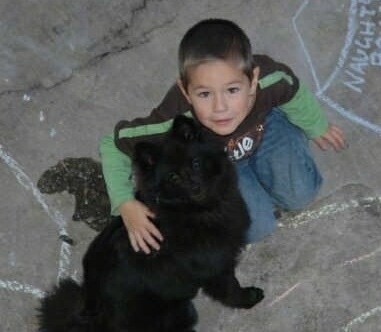 The Giant and Toy German Spitz have always been used as companion dogs, while the more common Standard Spitz was once used as a resourceful farm worker. The Toy German Spitz was imported to England from Pomerania, Germany, over 100 years ago and adopted the pseudonym Pomeranian. It was a favorite of Queen Victoria and was occasionally called the Victorian Pom. 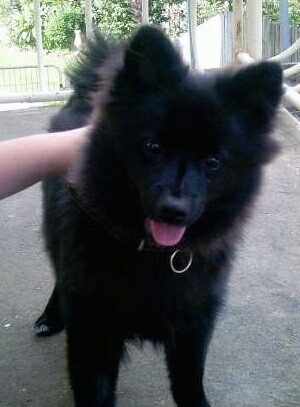 The Pomeranian has since developed separately with its own standard. 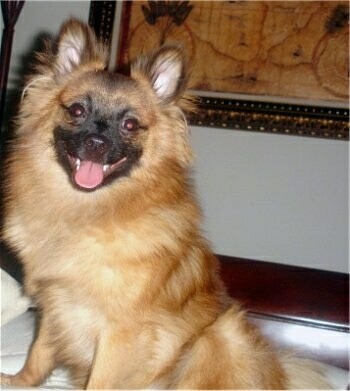 German Toy Spitzes and Pomeranians are very similar, but they are separate breeds. The German Spitz is rare and has been losing popularity even in its homeland. Nana the German Spitz Small puppy at 3 months old—"She is lovely! She plays all the time and she adores watching television!!!" 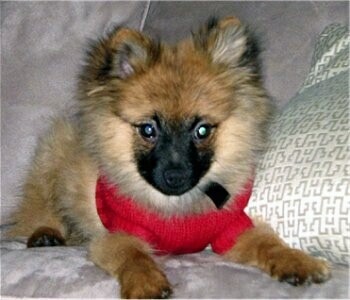 "Lil Bear, the Small German Spitz puppy at 3½ months old during the holidays of 2005!! He was a gorgeous puppy! He was a li’l trouble maker, but we wouldn't have had it any other way!" 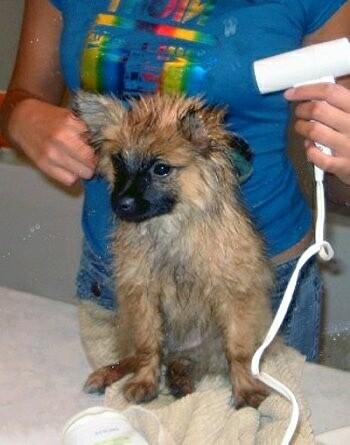 "Lil Bear’s first bath at 3½ months old—he was a very good boy! He LOVES being groomed!! His favorite part of the bath is being dried off! He loves to run around the house drying the excess water out of his fur himself!" "Lil Bear at 5 months—always smiling!! He has a very fun personality! He loves to run around in endless circles to show off! He thrives on human companionship! He is independent yet very loving!! He loves to go everywhere we go and do whatever we do. He makes our lives very interesting! The description you have for the German Spitz's describe Lil bear to a "T", especially the fact that they really do seem to be ALWAYS smiling back at you!!" 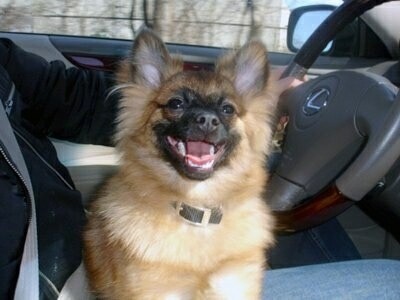 "Smiling Bear at 7 months loves car rides! He takes the road very seriously LOL. He even sits in the passenger seat with me wearing a seat belt!! He loves to watch other cars and scenery!" "Lil Bear all grown up—1 year and 2 months old! He really is the best boy in the world!! Very sweet, caring, affectionate, protective, loyal, submissive, playful, , and much more!! He really has grown into the perfect dog for us!!" "This is our dog Teddy at approximately 9 months old. We got him from a rescue shelter at 5 months old. "